This is a colourful addition to any train set. We like that it combines the classic features of a wooden train (compatible with other wooden tracks) and the educational benefits of counting and colour recognition. There were also lots of opportunities for imaginative play, which our testers demonstrated by taking it for a ride around the room, combining it with their other train sets and using it on the track. We liked that it was a toy that encouraged movement as the children travelled around with the onboard teddies! The little teddies were very popular and the children enjoyed putting them in and out of the train  this is good for promoting hand-eye coordination in younger children which contributes to their developing spatial awareness and fine motor skills. Some of the older children enjoyed the number sequence and were encouraged to remove bears and put them in the correct order, which promotes early numeracy and counting skills. The train could also be used as a teaching aid in the classroom, whereby an adult asks for a specific number or colour, encouraging colour and number matching and recognition. Best Toy - Toy Fair 2014 - Speciality Toys. Choo choo! 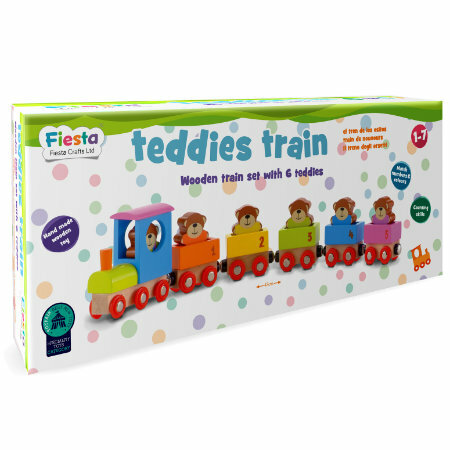 There's nothing children like to say more than 'all aboard', so take their fun and imagination to a whole new level with the beautifully designed Teddies Train. Suitable from age 18m, the Teddies Train set is compatible with other train track sets, and will encourage toddlers to match numbers and colours while helping to develop their counting skills. This hand made toy is wooden and extremely durable, making it a classic which can be passed down from sibling to sibling.